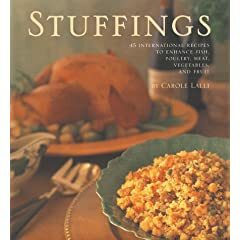 You should buy or bake your favorite on Sunday or Monday, because you want it to be a little dried-out by the time you turn it into stuffing. And by the way, Mom says the back-of-the-box is just fine. The stuffing recipe is below, and we’ll walk you through it on Monday. Put the sausage in a heavy skillet and cook over medium-high heat until it loses its pink color, about 5-7 minutes. Remove with a slotted spoon, set aside on paper towels to drain. Pour off the fat from the skillet, but do not clean the skillet. Return the skillet to the heat. Turn the heat down to medium and add the butter to melt. Add the onion, shallot, and celery, and cook, stirring, for 8-10 minutes, until they are soft but not brown; scrape up any of the sausage bits clinging to the skillet. Add the corn, sage, and thyme, and cook for 1 minute. Set aside the mixture to cook for about 10 minutes. Place the bread in a large bowl. Add the ingredients from the skillet, along with the parsley. Combine the ingredients into a rough mixture (your hands are the best tools for this task). Do not over-combine or break up the bread more than is necessary. If the mixture seems very dry, add enough chicken stock to hold it together loosely. Season with pepper and, depending on the saltiness of the sausage, salt.